Julia Ricks ’22 (Carnation, Wash.): My favorite part of college so far has been the professors. And the classes are really exciting. But also there’s all this other stuff you can do outside schoolwork, too—like I’m in jazz band, for example. It has nothing to do with my major, but that kind of thing is widely available. Annika Krueger ’22 (Emerald Hills, Calif.): Yeah, and we’ve been exploring a decent amount on the weekends. We went to a concert our first week, Bruno Mars. And we’ve gone out to get sushi in downtown Minneapolis, gone shopping in the city. We went to a University of Minnesota football game, too. The bus and the Green Line make it super easy to get downtown, or we can always Uber places too. There’s been plenty of opportunities to get off campus. Erik Anderson ’21 (Minneapolis): I didn’t really know much about Mac before getting recruited for basketball, even though I grew up 20 minutes away. But then the first time I came, I just really loved the campus and the people I met. And it’s been great being here so far—I broke my foot last year, so I didn’t get to play a lot, but I’ve really loved being on the team. It’s been a really great community to be part of. 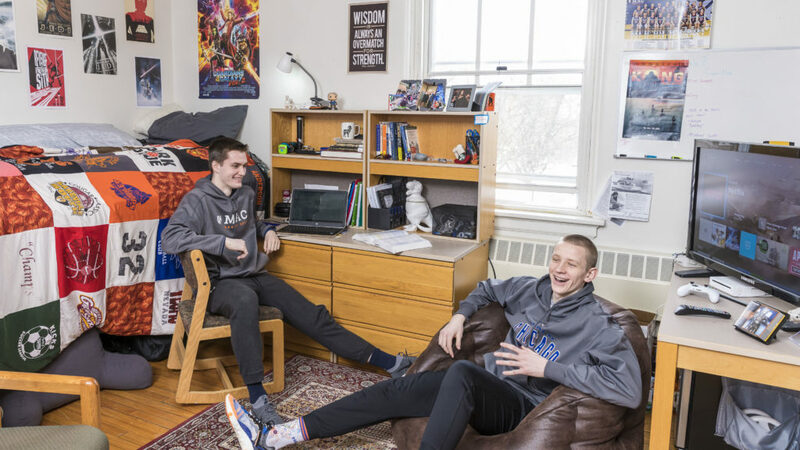 Jackson Henningfield ’21 (Orlando, Fla.): And I’m from Florida, so I didn’t know anything about Mac either until I heard from the basketball coach. But then I came out to Junior Prospect Day, and got the vibe of campus and the athletics. I got the sense that it was a place that would really challenge me, both on the court and in terms of working toward my degree. And everyone’s been really friendly and welcoming, so it wasn’t that big of a deal to make the move. Alisa Folen ’22 (Portland, Ore.): I was worried that I was going to be extremely homesick going away to school, but it’s been surprisingly easy to transition. 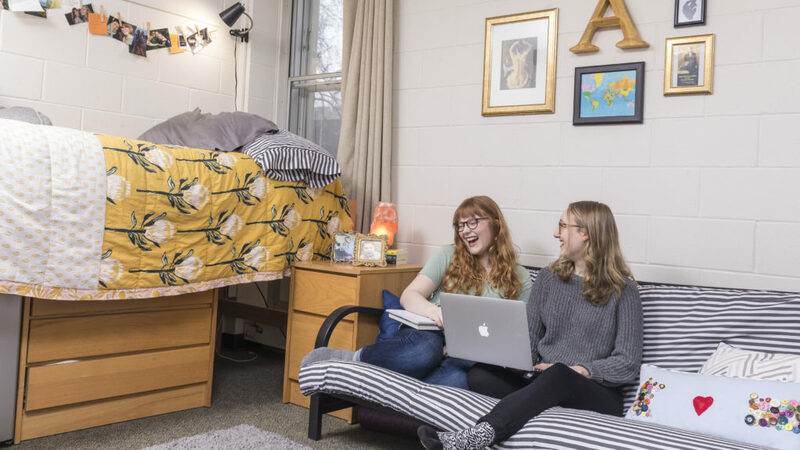 Annabel Gregg ’22 (Stillwater, Minn.): Yeah, we’ve been signing up for lots of things—like crew was a big one—which really helps you make friends. I had wanted to do crew since high school, but my high school didn’t have a team. So this was a great opportunity, and it wasn’t like an actual team where I had to try out. They had to accept me! Alisa: And I was actually going to join Ultimate Frisbee, but then Annabel and our friend Gabby joined crew, so I decided just to try it, too. It’s been great. We also signed up for the Nordic ski team, as a way to get off campus and keep doing things in the winter. That was another big friend-maker. 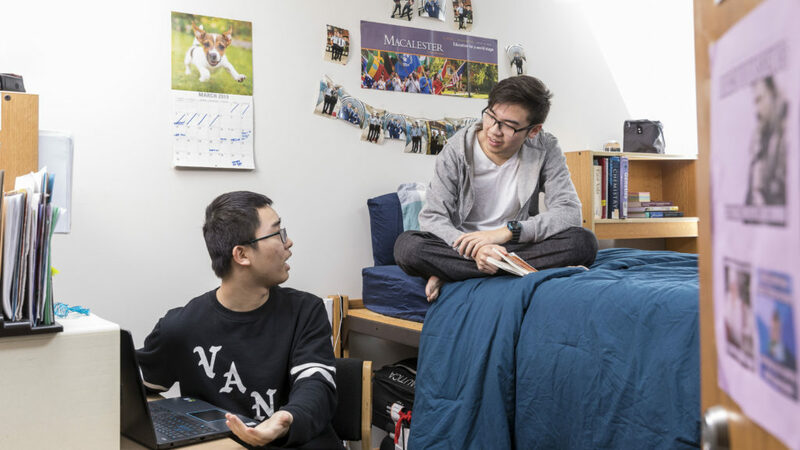 Chenxin Zhu ’22 (Zhangjiagang, China): College is a lot different than high school—you have a lot more time, because you might only be taking four classes, and you don’t have them every day. You learn to take more responsibility with managing your schedule. No one is there to tell you to do your homework or clean your room (although sometimes Brian will remind me). It’s challenging sometimes, but it’s not too bad. And when I went home for break, my mom was very happy to see that I was doing my own laundry. Brian Zou ’22 (Quincy, Mass. ): Yeah, first semester was great: I learned a lot, I read a lot, and I met tons of new people. And the classes have been super interesting. My favorite class so far is Intro to U.S. Latinx Studies. It goes back to the roots of how several identities—Spanish American, Mexican American, and Latinx—all came to be, and kind of how U.S. identities more broadly came to be. It’s also been very meaningful since I grew up as a first-generation student and Asian American, thinking about identity development in youth. That relates to what I eventually want to do, which is become a pediatric psychiatrist.